Don't take our word for it! Below you will find reviews from verified customers about ContentBlocks. Content Blocks is an awesome addition to MODX. Documentation is very thorough and the devs are extremely helpful! We're currently using it to allow clients to build their own page layouts using the puzzle pieces that we give them (via Content Blocks). Now we don't need 15 page templates when the client wants one page to be slightly different from the rest. Thanks, again for an awesome plugin. This plugin really brings MODX to new level. I love MODX because it's easy to manage and customize without bloated code, but with ContentBlocks my non-tech clients can publish content in nice dynamic layouts without me making yet another another template for them. I have been using pagebuilders with WordPress to, but what makes MODX+ContentBlocks great is, that I get to define which content elements there are and what code they genereate, simply GREAT! We are using the ContentBlocks plugin on some modx instances of our customers. The possibilities editing the page content are limitless. Before we used the plugin the process of structuring the modx backend was time consuming and somehow limited. Complex Slideshows or tabbed content can be provided effortless and in the most individual way. I dont want to miss the plugin and can recommend it to everyone who needs modular site content with joy. Content blocks is a highly flexible content manager that works seamlessly with Bootstrap with little effort to create feature rich layouts. ContentBlocks is a Must Have Extra! We've been using MODX as our primary CMS for most websites we've developed since 2009. MODX is by far the best Open Source CMS there is, for both designers and programmers. The free MODX Extras and support forum are amazing. The only thing MODX lacked, before modmore, was a good source for quality premium paid Extras. Since we've discovered modmore ContentBlocks has become our favorite MODX Extra. The support, fast replies from modmore (and Mark Hamstra in particular) and overall quality of the modmore Extras are unbelievable. I cannot wait to start using modmore's new Commerce Extra. If modmore develops a Real Estate MLS IDX Extra some day in the future we will happily never need to use WordPress again! Thank you to modmore and Mark Hamstra! You make MODX even better! Keep up the GREAT work! If you build sites for clients, or even if you build sites, and want to make adding content pages easy (and responsive!) 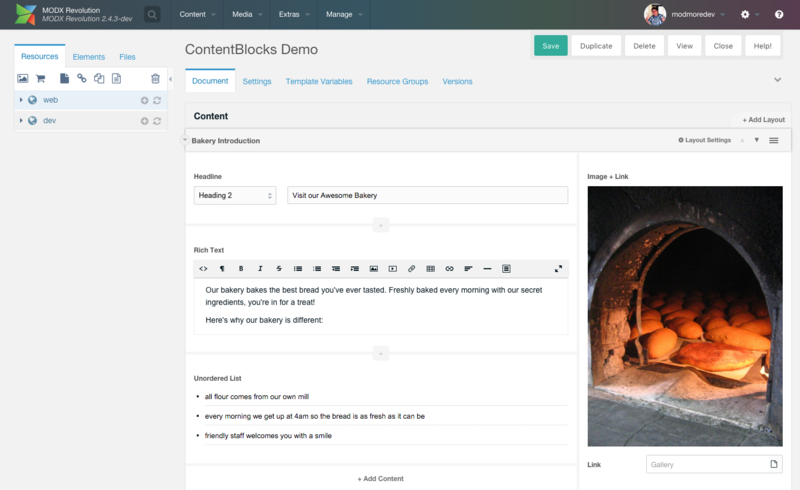 Content Blocks is an indispensable and 'must have' module. INCREDIBLY configurable, and (so far) 100% bulletproof, I haven't found a flaw yet. Fairly expensive at over $100 Canadian (My local currency), but still worth it in the long run. Well the plugin is great i think we can all agree. But the support is mindblowing. You just write an email to one of the developers! Its like chatting with a mate! Its very refreshing to get support from the source and not some third-party company that doesn't really know what they are doing. Keep up the good work! Our agency Sitsol is using Modx now for many years and we know our way in it. ContentBlocks opened a new world for us, a new way of dealing with templates and design for our customers. Most of all we love how easy it is for our client to work with and how we can reduces the use of templates. ContentBlocks has found his way in our top 5 of favourite add-ons for Modx. Thanks Modmore for this great add-on. 1) Fixed templates: For example for the home-, or contact page. The user can edit the block but cannot add more or delete a block. Only add blocks after fixed blocks in template. 2) Rules: For example gallery block only authorized after a rich text block. No gallery field after a headline filed. But in general it's hundred times better than the rich text editor. ContentBlocks adds flexibility and scope to what can be accomplished in ModX that's unprecedented in open source solutions. It makes the lives of website editors easier, it increases the efficiency with which marketers can test and optimizes key templates, landing pages, and conversion funnels, and for designers it unleashes a world of possibilities. This extra is fantastic, and backed by a responsive and professional team at ModMore. As developers we are delighted with the freedom, flexibility and time-savings this Extra brings to working in MODX. Clients love the clear and intuitive interface, allowing them freedom to manage their sites, populating pages with a rich variety of media, all handled quite effortlessly with ContentBlocks. The most innovative and powerful plugin i've ever seen for modx ! I wouldn't think of doing a site without ContentBlocks going forward, it really ups the game when it comes to end user experience, and has really increased the speed in which I can make simple updates / changes to customers sites. How it should be...true creative freedom! Wenn man einmal mit ContentBlocks gearbeitet hat, dann fragt man sich, wie man bisher ohne dieses Addon hat leben können. Es macht uns die Entwicklungsarbeit um so vieles einfacher. Und für den Kunden natürlich auch. Eine viel größere Freiheit in der Gestaltung von Seiten kann man sich eigentlich nicht wünschen. Content Blocks is just awesome! It makes content editing a breeze. With endless customization options it brings creative freedom to "the content field". Once set up, it makes adding content unbelievable fast. Totally amazing. You've outdone yourselves, modmore team! *We reserve the right to remove reviews that are: 1) not related to ContentBlocks, 2) submitted by users that have not purchased or used ContentBlocks, 3) offensive to our users or 4) otherwise break moral decency rules.